Many Belizeans are planning to go across to the Mexican side for Easter, and that's why today it was worrisome for many when for about an hour, the Northern Border with Mexico stood at a standstill. 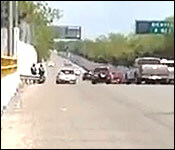 The Chactemal border crossing on the Mexican side was blocked with tree branches placed there by a group of protestors. The protest group was made up of about 100 residents of the small Mexican border town of Santa Elena, which is just across the old Subteniente Lopez Bridge. CTV-3 news reports that the protest was triggered by a sudden increase in the fee charged for importing items from the Free Zone into Mexico. The fee of 8 Mexican pesos for each dozen items imported was suddenly increased to 24 Mexican pesos and residents rejected it. Border staff on that side were caught off guard by the protest action this morning and had to move swiftly to secure the border area, and ease rising tensions. Border officials agreed to dialogue with representatives of the protest group about the increase in fees. This led to the protestors calling off their action against border officials. But, before that, CTV-3 reports that The protest effectively blocked movement and traffic from Belize and Mexico including early morning public transport and Belizeans had to wait in a long line before the situation normalized. It remained that way for the rest of the day, but the "fayuqueros" as they are called - who lead the trade with the free zone - are known to be surly and volatile.